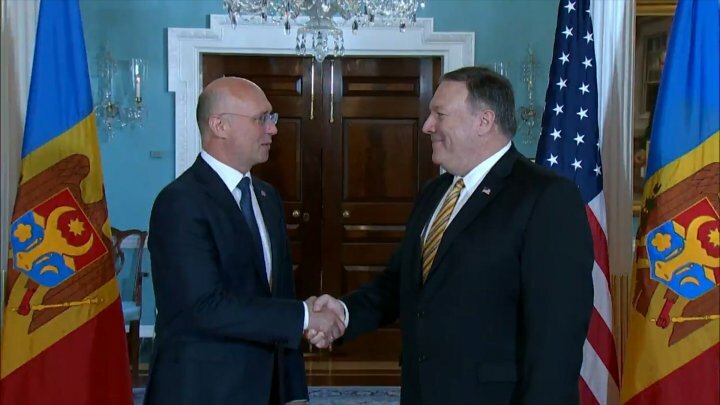 Cooperation between the Republic of Moldova and the United States of America, as well as the strategic dialogue between the two countries were discussed in Washington by Prime Minister Pavel Filip and United States Secretary of State, Mike Pompeo. The officials have spoken of the regional security situation from the Eastern Europe and highlighted the importance of collaboration between the Republic of Moldova and the USA. "The most important event of PM Pavel Filip's agenda has taken place. It is an important event where United States Secretary of State, Mike Pompeo has met with Ministers from Chisinau. They spoke of relations between the two countries, as well as the threats that the United States of America has recently faced and will face in the near future. It is important to mentioned that discussions had a positive tone, especially since Mike Pompeo expressed his support for the Republic of Moldova and mentioned that the United States of America will continue supporting the Republic of Moldova in its desideratum to be part of the western world and support the Republic of Moldova's European integration, especially its wish to be closer to the western world" PRIME journalist Alexei Lungu said from Washington. The official expressed his gratitude for the constant assistance the USA offered in promoting structural reforms and democratic values in Moldova, mentioning as priority to continue implementing the EU Association Agreement and unfolding transparent general elections. Prime Minister expressed his gratitude for the USA's implication in solving the conflict with Transnistria, through the 5+2 negotiations. At the same time, Pavel Filip reconfirmed the wish of authorities from Chisinau to amplify communication on subjects tied to reforming the defense system of the Republic of Moldova, consolidating energy security and trade collaboration. In his turn, United States Secretary of State, Mike Pompeo, supported the maintenance of an active dialogue with officials from the Republic of Moldova in the field of regional security.